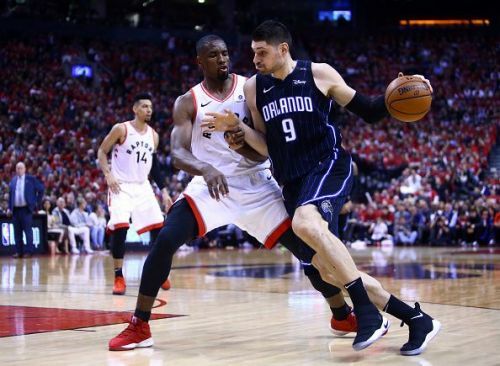 One way of looking at the Orlando Magic's 2018-19 season is to note they finished 16 games behind their Eastern Conference 1st round playoff opponent the Toronto Raptors. At 42-40, compared to the Raptors' 58-24, no-one would consider these two teams as equals. However, another way to see the Magic's season is as one with a team determined to prove themselves. They were in playoff mode even before this weekend unfolded - winning eight of their final ten regular season games, moving from the 9th seed in the East into the seventh seed. On Saturday night, they continued where they left off with a surprise win, knocking off the heavily-favoured and homecourt Raptors 104-101 courtesy of D.J. Augustin's game-winning 3-point shot. Augustin himself was a one-time Raptors' player, having signed as a free agent in the summer of 2013. After just ten games, he was waived that December. This past weekend though, he got a measure of revenge - scoring 25 points and being a nuisance to defend against throughout for the Raptors to contend with. It also didn't help that their matchup against Augustin, one Kyle Lowry, once again delivered a poor playoff performance. He went scoreless and certainly received harsh criticism from media and fans alike in the aftermath. 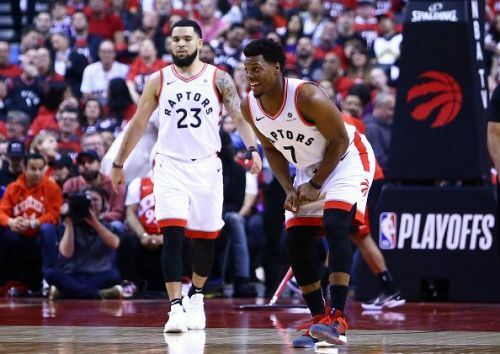 This continues a frustrating trend for Raptors fans as six years of inconsistency in the playoffs has seen Lowry struggle once the lights shine brightest at times. So naturally on Tuesday night in Toronto, Lowry will have an opportunity to atone for a poor shooting night and perhaps turn the Raptors' fortunes around too, as they pursue elusive playoff success. Orlando's head coach is likely to start D.J. Augustin, Evan Fournier, Aaron Gordon, Nikola Vucevic, and Jonathan Isaac. The Raptors are likely to start Kyle Lowry, Danny Green, Kawhi Leonard, Serge Ibaka, and Pascal Siakam. First of all, expect the Raptors to tie the series 1-1 Tuesday night. Their playoff mediocrity aside, for the moment, they were a dominant home team in 2018-19. The Raptors won 32 of their 58 games at home during the season. If Kyle Lowry's back is not hurting, Saturday night's performance was frustrating but expected as this is the sixth successive year he has delivered at least one poor display when the pressure is high. Injured or not, this would logically explain why when the Grizzlies called Toronto and offered Marc Gasol, Raptors management tried to expand the deal to include swapping Lowry for Mike Conley too. Between elbow injuries, a sore back and just an inexplicable lack of production, Lowry has never been considered a top playoff performer for the Raptors. 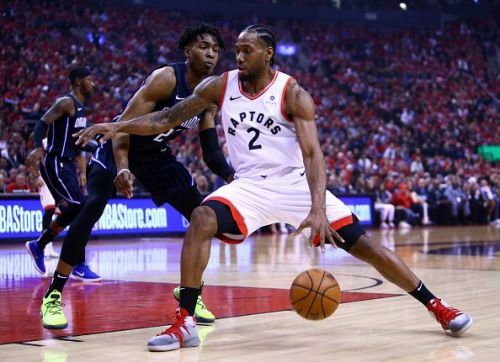 Considering they lost by three points on Saturday, it means a layup and two foul shots, or even a 3-pointer and mid-range shot made by the 32-year-old would see the Raptors lead this series early on. Lowry had zero points and must find a way to contribute offensively, other than assists, for the Raptors to succeed. The Raptors, who can play some intense and stifling defense, must play it throughout the full 48 minutes. When they attempted to get serious defensively, Augustin was already hot. Danny Green began picking him up from full-court in the third quarter, even though it's a tactic Nick Nurse should stress is adopted throughout. Defensive communication is an immense part of defensive success for any team. On the game-winning three-pointer from Augustin, Vucevic - guarded by Gasol - set a screen, moving to his left. When Augustin utilised the screen, his primary defender Leonard failed to beat the screen, meaning Gasol had to slide over to guard Augustin but by respecting the guard's speed, Gasol also backed up. This created both time and space for Augustin to calmly, easily release the shot and win the game. Had Leonard anticipated and reacted quicker to Vucevic's screen, the 6ft American might not have gotten an open look and instead either forced to miss or a more difficult shooting angle. As for the Magic, they need to get more from Aaron Gordon. Their athletic power forward was very quiet in game one. Despite recording a double-double with 10 points and 10 rebounds, he was a lowly 3/10 from the field. Nikola Vucevic, the Magic's only All-Star, was also quiet in terms of his shooting efficiency. He shot 3-14 from the field and combined, it doesn't make for positive reading from the influential pair - who can have a significant baring on whether this is a series or not, going forward. 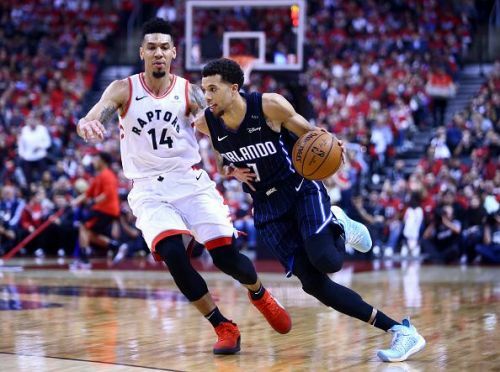 The foul line also played a role in game one, as the Magic shot 18-20 from the charity stripe while the Raptors were just 9-14 for 64%. 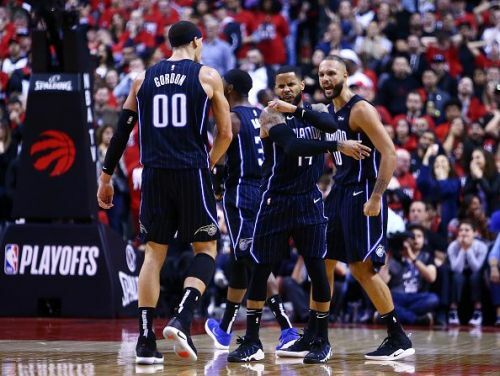 If the Magic can keep the Raptors in foul trouble and make their own foul shots, it'll go a long way to keeping them close in games during this first-round series. With all of that in mind, the Raptors should be able to overcome their game one shortcomings and win game two Tuesday night by a seven-point margin.